Decorating your home using natural elements for every day beauty or holidays, simply begs for pomegranate inspiration and fun. There are so many ways you can use the richly colored red, burgundy, or purple pomegranates to add accent color and beauty to your home or special occasion. Why not use a symbol of fertility to decorate your wedding reception? Do you have a pedestal cake stand? Line it with greenery of your choice and then layer several pomegranates over it in a random manner so you cover the entire surface of the pedestal. Add a few more rows of fruit on top of the bottom layer and then add small flowers or additional greenery in between the fruit. Surround the bottom of the cake stand with more pomegranates and greenery. Using a large crystal or glass bowl, fill the bowl with decorating beads or rocks on the bottom and fill with water. Float tea-lights and pomegranate fruits in the bowl for the center of the table or as a sideboard decoration. Surround the bowl with additional candles and pomegranate fruits along with greenery or baby's breath. Fall is the ideal season for using pomegranates in your autumn themed displays. Layer them in with the pumpkins and gourds on a table or buffet to create a lovely fall display. Use them outside in baskets or bowls right beside your jack-o-lanterns to add beautiful eye-catching hues of red and burgundy. Fill a cornucopia with pomegranates spilling out – great for a foyer table, outside entry (on a table), buffet table, or in the dining room. Add some fall leaves for texture and visual interest. Here are some quick and easy ideas for Christmas decorating using pomegranate inspiration. Pile pomegranate fruit and large pine-cones on a wooden cutting board and then add pine boughs and holly berries to the mix for a gorgeous display of color. Attach pom fruit to a green wreath or grapevine wreath using heavy gauge wire. Pierce the end of the fruit opposite the crown and then tie to the wreath. Add embellishments like bittersweet, pine-cones, holly, fake birds, pretty baubles, or poinsettia flowers. Remember fruit stamping as a child? Cut open a pomegranate fruit and allow to sit on a paper towel to soak up any juice and then proceed like you would with any fruit to create a painted pomegranate. Dip the fruit into paint and then press down on heavy card-stock until you are sure the print has taken to the paper. Lift, allow to dry, and then mat and frame it as art for any room of the house. 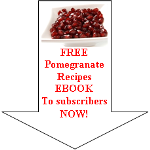 Read enough about pomegranate inspiration and want to discover more pomegranate information?